DI Tom Mariner is grieving the sudden loss of his former partner Anna and takes a couple of weeks leave from his job in Birmingham to go on a solo walking holiday in Wales. Unfortunately, his need for peace and solitude to help him grieve is lost when he is caught up in a murder investigation following his finding of a dead body. He never expected that he would find himself, with all of his previous experience, as a prime suspect in a murder investigation. Tom discovers that there are a number of disturbing secrets being kept behind the closed doors of the ancient stone farmhouses that populate the region. At the same time as Tom goes away a violent criminal is released early from prison as he is dying from kidney cancer. As he has a terminal illness he considers he has nothing to lose by settling a few scores and consequently he kills several of his old acquaintances before he makes a getaway into Wales. BLOOD AND STONE is a very well plotted police procedural with some beautiful descriptions of walks in Wales and the youth hostelling and camping experience. 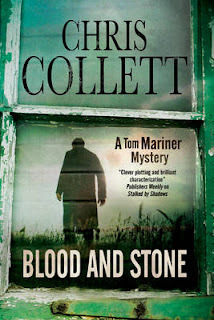 The author is very clever in her manipulation of the plot and the red herrings that she suggests, that can send your mind racing in one direction until perhaps Tom Mariner sees something accidentally, which triggers a different line of enquiry and you momentarily forget your earlier conclusions. There are a number of characters in the police and potential killers which I found a little confusing at first but it all turned out right in the end. I must admit though, I had no idea who the killer was until the very end and it was a big surprise. This fast-paced story was very gripping and I just could not put it down and I am pleased to discover that she has written several other books in the series which I must get. Extremely well recommended. Ohh, as this one is based in Wales I think I'm going to have to pick up a copy! :) Great review! Have just finished Stalked by Shadows and couldn't put it down. Will definitely get Blood& Stone next.